Helpful Articles by Karin Galliano, Ph.D.
Studies confirm what pet owners have known all along—pets provide people with more meaningful, purposeful lives and more life satisfaction and happiness. The research also backs the physical, emotional, mental and social health benefits provided by pets. 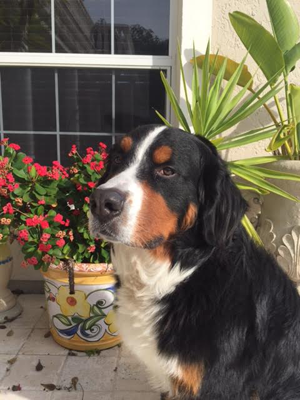 Although the statistics provide important information in a cold, scientific format, all that research comes to warm, fuzzy life as Axl, the giant Bermese Mountain dog belonging to Dr. Karin Galliano of the Peace River Psychology Center, offers his paw to the center’s patients. “You know, life is always entertaining,” Dr. Galliano said of the benefit of having pets. Axl looks sort of like a teddy bear, and he works half the day assisting Dr. Galliano with her therapy sessions. Axl comforts patients who are grieving and he assists Dr. Galliano with treating phobia patients. Mary Toor, the “petspert” for Camp Bow Wow in Port Charlotte, cited studies that have shown obtaining a new dog helps improve mental and emotional health of people. A dog’s requirement for physical activity outside the home is what makes it the No. 1 choice when considering the positive human health impacts a pet can provide. While other types of pets can provide benefits such as emotional companionship, dogs keep people on a predictable schedule and draw their owners outside of the house. Dr. Galliano cited examples from a book titled “The end of Illness by Dr. David Agus.